Your questions, advised definitively. This week: Would you forego the need to eat if it meant you couldn't reproduce? Can a person like sneezing too much? Like, WAY too much? Is the Law & Order theme song actually a dog? And finally, were we—technically—not totally hoisted by a story in last week’s show? Let's take a closer look. 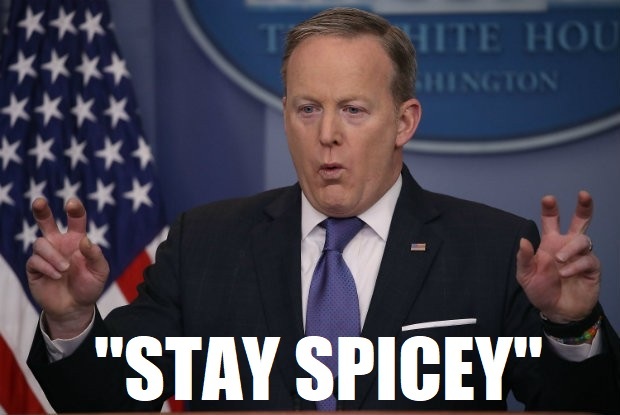 I was on board with the campaign to stay spicy, but this closing message was too much. It's also available... online. For free. I don't know if they've added anything new in the app versions, i think unlikely. P.S. Finished it (the website version) years ago. There are many other web-games like this, in particular: Kittens. The iOS version was made by a different person who did make some interesting changes and additions. When you complete it on iOS there's audio commentary from both the original dev and the porter, and it comes off as a really interesting collaboration. But yes I should have definitely remembered the original web version and mentioned it, my bad. So is "The grenade rolls down the hill" a very literal example of being hoisted by one's own petard? Yes. It turns out Hoisted is in fact the literal IIT equivalent of The Grenade Rolls Down The Hill. We have but one meme. As someone who absolutely hates sneezing, I applaud the corrupting effect the contents of this cast had on Chris' enjoyment of it. I haven't listened yet, but there's also a prequel game to A Dark Room called The Ensign. I believe that one is only on iOS. Coincidentally enough, I also downloaded A Dark Room on Android last week (it was on sale for free at the time). I had played the web version years ago and it was neat to revisit. I've completed The Ensign as well. I didn't mention it on the show, because it's not really as impactful as A Dark Room, but it's fun. And yeah it's only on iOS because it's a new game by the guy who did A Dark Room's iOS port; it's not by the original author of ADR. Just getting into this episode. But did we just find out that "hoisted on his own petard" is a Shakespearean "grenade rolled down the hill"? Also I see a dark room is being endorsed here. A couple friends of mine just uploaded prototype inspired by a dark room that people might be interested in called Armory and Machine. It's on Android now, but should be out on iOS soon. The "you have 72 hours to breed" movie idea sounded a lot like The Lobster, which posits a world in which adults who are unable to find a life partner are killed and their remains are turned into an animal of their choice. That deadline is a bit longer than 72 hours (I'm thinking it was maybe two weeks), but the atmosphere of horny dread is very much in line with what you had in mind I think. This is a good episode. I had seen the episode description several days before actually listening and was convinced that "Is the Law & Order theme song actually a dog?" was referring to to the clanging jail door sfx sounding like a dog barking and I was all "Yeah, totally, that clanging jail door sound sfx sounds like a big dog barking, what a good observation" and then I actually listened to the episode and it wasn't about that at all and then went back and listened to the clanging door sound and of course it doesn't really sound much like a dog. Thanks for A Dark Room endorsement. I noticed it's free again for Android for the next three days. Going to check it out. On iOS it seems to cost 2€ in Europe at least.